The refurbished Apple iPad Air 2 is as good as new. Each individual iPad undergoes a stringent refurbishment process which includes the replacement of defective parts, a thorough clean and a full inspection. It is then repackaged in a new box. This stringent refurbishment process is conducted by Apple. When you purchase a refurbished iPad you are guaranteed a fully functional tablet. Tablets may have minor cosmetic imperfections, such as scratches or marks, but everything will be working perfectly. Each tablet meets premiere quality standards. 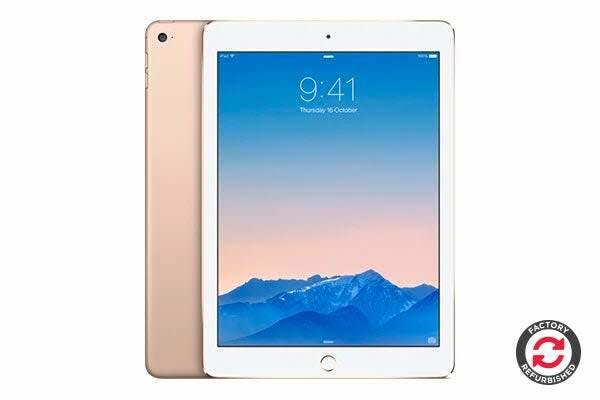 Packed with amazing features, the Apple iPad Air 2 brings entertainment to life in one neat, little package. 18% thinner than its predecessor, the Apple iPad Air 2 is stylishly designed to be thin and light – and yet it is still powerful enough to keep up with your busy lifestyle! Boasting an A8X chip with 64-bit architecture, the iPad Air 2 delivers optimal CPU and graphics performance, meaning you can do more of the things you love, without compromising on speed and power. 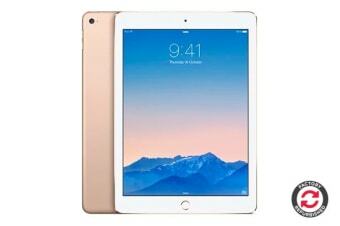 The iPad Air 2 makes downloading movies and streaming online content a breeze. This Wi-Fi model lets you make faster connections with speeds of up to 866Mbps. Using 802.11ac Wi-Fi and MIMO technology, it delivers super fast Wi-Fi performance. The amazing 8MP iSight camera will also impress, letting you take stunning images and videos in Full HD mode, and keep more faces in sharp focus with advanced face-detection technology.